Ran into a problem when trying to setup a Web Listener on TMG. This is NOT a Cryptography Next Generation (CNG) certificate because TMG (and ISA) don’t support CNG (V3 Certificates). So that is not the problem. 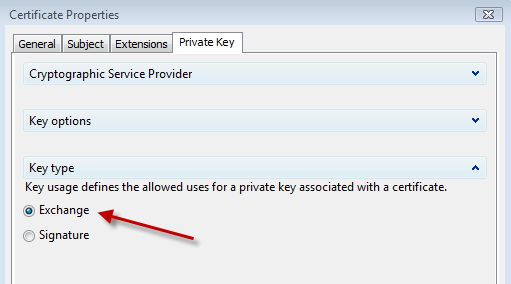 After digging around and looking at manual certificate requests, I noticed that the KeySpec was not set the same. 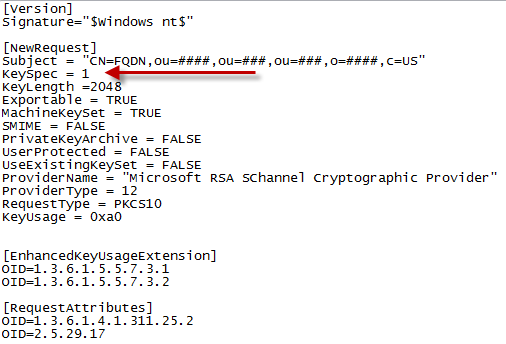 It seems that by default KeySpec is set to 2 when doing a manual certificate request on Windows 2008R2. On a similar note, the above “Default” seems to also be a problem when doing custom Certificate request for Domain Controllers that are running the Active Directory Web Services. So looking at this, the ADWS is failing because the server can not make a SSL connection with itself.